Kobenstyle, a unique blend of exquisite design and superior performance in a selection of vibrant colors. Originally designed in 1956 by Jens H. Quistgaard, the name derives from the design style of Copenhagen, Denmark. The cookware is recognizable for its 3 point welded handles and inventive lids that double as trivets and create the perfect surface for stacking & storing. Kobenstyle dinnerware, designed by Paul Thonis, coordinates beautifully with the cookware and has the same signature 3 point handle on the mugs and serve bowls. What do a car and this Kobenstyle casserole have in common? They both are finished with three coats of enamel. And this casserole has a sporty red finish. 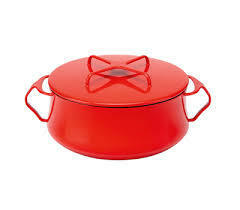 The casserole moves effortlessly from stove to table, where its convertible lid becomes a trivet. It’s easy to clean too, no polishing required! Hand wash; for more thorough cleaning: fill with hot soapy water and allow to soak for one hour.